In the early hours of the morning, Lee greets me at her home in Ban Khouthineung, a village within Luang Prabang Province, a community where the Hmong ethnic minority predominantly live. Despite the time, the air in Laos is thick with humidity and the sun has already begun to beat down over the land. Lee is in a pink nightgown and slide-on sandals. Her tiny frame makes her pregnancy all the more apparent. She explains through the interpreter that she is eight and a half months pregnant, which is even more impressive given the labor involved in cooking for her family. She leads me around the back of her house, where two small fires burn. These are her stoves, and everything we cook today will be prepared over the small glowing coals. Cooking with fire is the way of the Hmong people. The exception for today will be the steamed white rice, a staple of the Hmong diet, which we are going to make via electronic rice cooker. It’s in this moment that I realize there is an intersection between the customs of the older Hmong generation and the modern innovations of new, twenty-first century Hmong people. Utilizing traditional cooking methods is a form of cultural preservation, but the time and effort required still make these traditional techniques an arduous task. With no dining room or large table, families traditionally take turns eating. Men eat first, then children, and finally the women. For the younger Hmong generation, this is no longer the way it’s done, except at festivals and large gatherings, where this custom of taking turns to eat is upheld for the sake of tradition. The Hmong and the majority of Laos differ in their religious beliefs. The Hmong practice animism and shamanism, and it’s said by the older generation of Laos that ancient magic is still practiced in many Hmong villages. Older Hmong still believe in magic and magical fixes for most ailments and problems- love spells for unwed women, concoctions of herbs to aid fertility, and animal sacrifices for sick babies. In many ways, food is a modern extension of these beliefs; a “practical magic” of sorts. The Hmong believe firmly in the healing powers of food. Even the millennial generation of Hmong, who are more likely to have been exposed to Western medicines, subscribe to the philosophy of food as medication. Young Hmongs who live away from their home villages are known to return when they feel ill so that the women in their family can cook food that will “cure” them. Culture Clash: Who are the Hmong? For a country roughly half the size of Thailand, Laos is extremely diverse. 42 ethnic minorities call the landlocked nation home. The Hmong are descendants of the primitive tribes of the steppes of Mongolia and China, and live primarily in the northern, more mountainous region of Laos. Like many tribes in Laos, the Hmong’s origin and traditions are well-documented, but their recorded history is scant. Little is known about the Hmong people today, and what historians and researchers do know is violent and troubled. During the Vietnam War, American troops trained people in Northern Laos to help their war efforts. This was done entirely in secret. After the war ended, the Laotian government deemed the Hmong people traitors and ordered their “extermination,” leading to an ethnic cleansing that has remained off the official record and shrouded in mystery. It’s estimated that 100,000 Hmong people died in their attempts to cross the Thai border to escape persecution. The migrant roots of the Hmong people are directly reflected in their cooking. As the day moves on, I see recurring ingredients: chili, spring onion, tomato, and garlic. These are used in almost every dish I make with Lee throughout the day; a subtle nod to the Hmong past, when scarcity of resources bred innovation in cooking. The Hmong journeyed across long migrant routes and could only carry the very basics, including the most basic, easy to transport food. Women, who were responsible for cooking for the entire tribe, maximized these foods by creating varied recipes with repeated ingredients. Laos, as a country, is at a crossroad. According to paper published by the University of Central Oklahoma, the Hmong ethnic group are at high risk for losing their traditions—textiles, music, language, and food—with the rapid growth in tourism, which has helped Laos as a country develop economically, but which means local tribes struggle to preserve their culture and customs. The Buddhist practice of tak bat, or almsgiving, has evolved into an event where tourists pay to partake in the rituals without any context, and without knowing the proper etiquette to which they should adhere. Many take photos of monks and novices from too close a proximity, others do not dress appropriately, leaving their knees and shoulders uncovered. 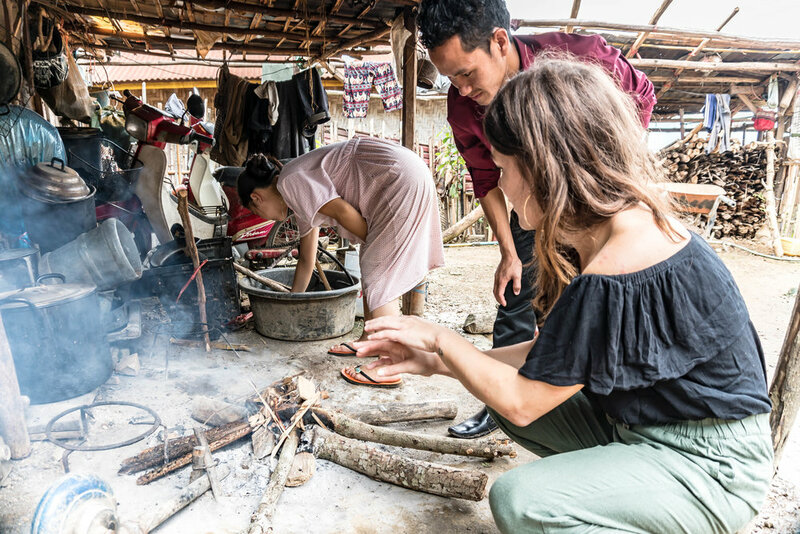 In spite of the tragedy and adversity the Hmong have had to overcome in near silence, the Hmong have managed to create a home for themselves in Laos. While their lives are no longer in danger, it is now their cultural heritage they must preserve, since their food has become their history where records and memory fail. Rattan, a kind of palm often used in the Western part of the world to make furniture, is grilled over the fire until the sharp spikes on the outside become charred and black. We do the same with eggplant. The burnt skins of both plants get stripped away. Hmong typically eat three meals a day, with the staple of each being steamed white rice. Vegetables and meat accompany the rice in smaller portions due to the cost of produce. I place the cooked vegetables in a mortar and pestle with chopped chilis, salt, and onion to make jeow, a dip eaten with rice or khaiphaen, sundried Mekong river weed. Through the translator, Lee instructs me to use the pestle to pound and grind the ingredients. As I begin mixing the ingredients in the bowl on the wooden table, Lee giggles. She politely takes the cooking equipment from me and places it on the ground. Her pregnant figure squats all the way down and begins pounding the pestle into the mortar rhythmically. Though she is squatting, beating food in the dirt, she is the embodiment of grace. After roughly five minutes spent listening to her work all the food together, she hands me the mortar and gestures for me to put it on the table. The jeow looks simple, even anti-climatic considering the time spent tending to the fires, turning the eggplant, waiting until it burns only exteriorly, and then beating it repetitively. It would be so much easier to use a food processor, but this is what I’ve come to Lee for—to witness the origins of the food I could pay top dollar to eat a gentrified version of in resort restaurants around Luang Prabang. As we sit on small plastic stools around a short, round bamboo table, I realize that we’ve spent hours preparing the meal we are about to eat. It feels almost ritualistic in its presentation; like consuming what we’ve spent all morning cooking over a fire is the final step in a ceremony.